Rock of Ages is a Broadway show which has recently taken up residency in the Shaftesbury Theatre, and, before they’d even finished a full run through in rehearsals of Act One, had ALREADY announced an extension to the original run, taking it through to October 2012. Such confidence I have never seen in a production before, and so I was definitely intrigued to see if the show was going to live up to the hype that it was generating for itself! From the moment you go into the theatre, you can just tell that they are here to stay! The entire auditorium has been transformed into a crowded L.A. strip, and there is merchandising available up to the eyeballs – they even have a Rock of Ages photo booth! It actually feels a little bit a U.S. ball game, in that they will serve you beer, refreshments and merchandise FROM YOUR SEAT! 😮 (as you can tell, I’m used to traditional musical theatre behaviours, right?! hehe). They have made an exception to the usual ‘beer only in plastic’ rule, and serve bottles of beer, in a bid to keep that 80s vibe going (although, the downside to this encouragement to drink is that, during the interval, the toilets were particularly busy, with one – hopefully intoxicated – gentleman – and that term is used loosely – actually urinating in a sink!!!). One piece of merchandising that you are going to want to buy on the way in though is one of the light up lighters, for use during all of the ballads – really wish I’d got one now! In terms of the show itself, I’m going to state right now, that I actually loved it! Here’s the ‘trailer’ for the show – note that it has the US cast. Sure, it’s no Les Mis, but I like that this show is aware that it’s a little mainstream and unconventional, and at some points in the show, it becomes very self referential – I like that it’s not trying to be something that it’s not. This makes it more endearing, and MUCH easier to review, to be honest! The story line is as you’d expect, rocker dude likes a babe, babe likes rocker dude, typically neither possesses any kind of social skills, so they both drift apart into various disappointing lifestyles, few years go by… etc etc… Certainly charming enough that you can easily follow it, and feel some empathy with the characters. The show makes great use of songs from the 80s, and not just the ones that everyone has heard of, which is great – as, as a big fan of 80s rock, it’d be great to see some of the less well known songs see a resurgence! The vocals throughout the production proved to be very strong. I don’t recall hearing a bum note at all, and I was frequently singing along and dancing in my chair (which nobody else minded, as they were all doing the same!!). 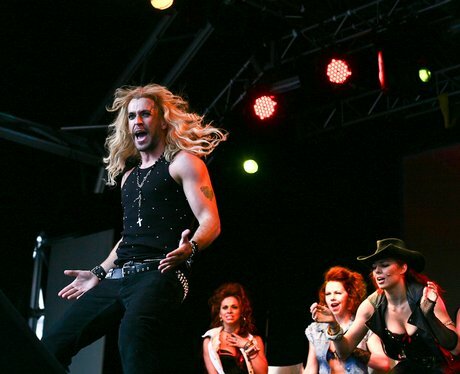 The overall reaction to the show from people who have seen it thus far, seems to be ‘I wasn’t expecting much, but when I came out, I found that I loved it!’ – I’d attribute much of this to the way that the show is being marketed at the moment, with Justin Lee Collins and Shayne Ward appearing as the poster boys, across London. I think that perhaps people are a little weary of the casting, but I would definitely say that people need not have any worries about any member of this cast, be they lead or ensemble! Shayne Ward shows that he has a perfect voice for musical theatre, and a body to die for!! (which is on show quite a lot, and at very regular intervals throughout the performance, incidentally!). If you want to see it, then you HAVE to buy a ticket – no pictures here, hehe! Justin Lee Collins is fantastic, as I knew that he would be, and it was great to hear more of his singing voice, as, from what I’d heard of it in the past, I really like it! After this performance, I have to admit that I am just a little bit more in love with JLC! hehe. Oliver Thompsett, as the leading man, is a very accomplished musical theatre star, and it is great that he finally has a show that feels completely his own (plus he looks SUPER HAWT as a rock boy! 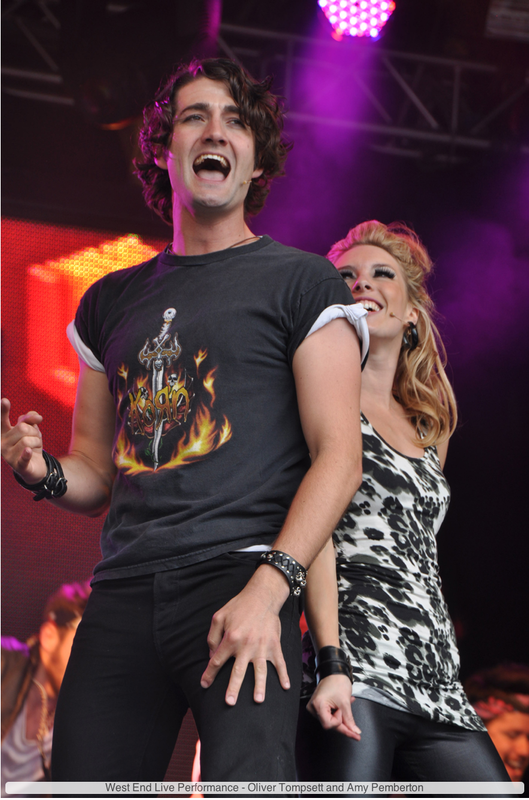 ), and Amy Pemberton, as his opposite, has an absolutely stunning voice! As the narrator, Simon Lipkin does a fantastic job, and is perhaps my favourite character in the whole show, despite the ratty 80s mullet, and amazing array of lewd t-shirts hehe!! It’s great that this production has the band on stage, well, you’d expect no less! It really feels fantastic to hear chunky electric guitar riffs coming out of the sound system of the Shaftesbury. It is perhaps testament to their playing that, at the end of the show, when all the cast had gone, people still stayed in the seats to hear them play out! Perhaps even more commendable, for me, is that even though this show is still in previews (it doesn’t technically open until September 27th), it appeared to me to be technically flawless! Sure, there were one or two little bits that seemed to go a little wrong, but there was nothing that was inherent – you can’t really prevent a cap falling off the stage, for example, and this will always happen from time to time. There was nothing that I particularly would like to see ‘improved’ or re-written, I think it’s pretty much there already! By the end of the show, you’re guaranteed to be up and dancing. At my performance, literally there was not a single person on any of the levels who was not stood up and singing/ dancing along. They manage to make an incredibly huge mess at the end of the production (JLC totally hit me in the face with his biggun!!) and it all just adds to the extraordinary fun that you have for the last few minutes, before you leave the theatre positively buzzing! I am not too sure how the movie starring Tom Cruise is going to pan out… I imagine that it’d have to be very fluffy and ‘silly’ in order to encapsulate the atmosphere of the stage show, and I’m not convinced that Tom Cruise is going to be able to manage that, if I am honest. My worst fear is that they’ll turn this into a ‘movie’ movie. Still, it’ll be good to see how it comes out! Rock of Ages goes right up towards the top of my list of ‘must see’ shows for any visitor to the West End. The pricing is fairly reasonable, and not as exorbitant as other shows, and given the whole ambience, quality of show and talent etc, I really do feel that you get great value for money! Seriously, I doubt that anyone could ever dislike a show that is *SO* 80s! Lighters, bottled beer, lazers, confetti, streamers, and mullets – oh my! I genuinely loved it, and am already planning my next visit! 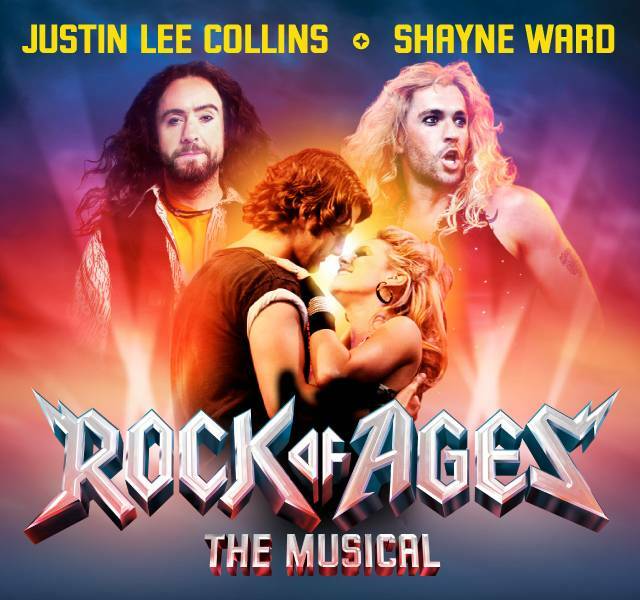 Rock of Ages is currently playing at the Shaftesbury Theatre, and is currently taking bookings all the way up to 20th October 2012 (I would be surprised if this doesn’t extend further in the future in the coming months). The show duration is 2 hours, 20 minutes, and they have a range of early evening matinees during the week. Further information can be found on the Rock of Ages official website. Oh, and one last thing – this video is ACE! Love the vocals and it features two of my favourite performers!! heh! I saw Rock of Ages show last night 8th June. The funniest show I have ever seen on stage. All the cast are absolutely brilliant with so much talent. Simon, you are amazing, you made me laugh so much, definitely will see the show again. Also feel very flattered when you asked me to see you in your changing room…of course that’s part of your act but you sure put a smile to a face. Also, thank you all for talking your time and signing autographs.